Obituary for Angeliki Kapantais | Wyman-Fisher Funeral Home Inc.
Angeliki Kapantais of Park Ridge, NJ passed away on January 19, 2019. She was 62. 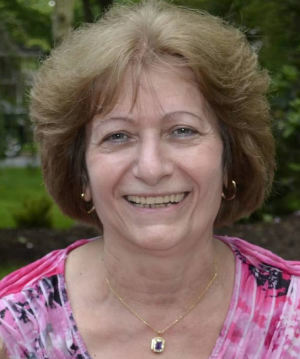 Mrs. Kapantais was employed as a Teacher's Aide for Jawonio, Inc. in New City, NY for many years before retiring to devote her time to her grandchildren. Mrs. Kapantais was born on May 10, 1956 in Agrinio, Greece to Nikos Karamboulis and Fotini Bakola. She was 1 of 6 children (4 brothers and 1 sister). On May 24, 1972, she married Ioannis Kapantais in Halkida, Evia, Greece. She emigrated to the United States in 1977 with her husband and 2 children. Mrs. Kapantais will forever be remembered as a loving and devoted wife, mother, and grandmother. Devoted mother to daughters Anastasia Vlamis and her husband George, and Niki Kapantais. She also adored her four grandchildren, Raphael, Andreas, Angeliki and Andreas. She is predeceased by her husband Ioannis Kapantais,, who passed away on June 19, 2016. Funeral service will be held on Friday, January 25, 2019 at 10:30am at St. Constantine and Helen Greek Orthodox Church in West Nyack, NY. The family will receive their friends from 9:30am to 10:30am at the Church. Interment will follow at George Washington Memorial Park, Paramus, NJ. In lieu of flowers, the family asks that donations be made to the American Cancer Society.